All 28 members of the United States women's national team squad have begun legal action against the US Soccer Federation (USSF), just months before defending the Women's World Cup title. The discrimination lawsuit relates to equal pay and working conditions. Players - including Carli Lloyd and Megan Rapinoe - are urging the governing body to "promote gender equality". It follows a discrimination complaint made by five American players in 2016. The US have won the Women's World Cup three times - at the inaugural 1991 tournament in China, the 1999 event hosted by the US and then in Canada four years ago. The men's team made the quarter-finals in 2002, while their best finish remains the third place in 1930. 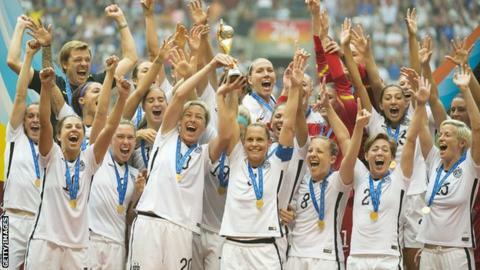 The lawsuit, filed with the US District Court in Los Angeles, stated: "Despite the fact that these female and male players are called upon to perform the same job responsibilities on their teams and participate in international competitions for their single common employer, the USSF, the female players have been consistently paid less money than their male counterparts. "This is true even though their performance has been superior to that of the male players, with the female players, in contrast to male players, becoming world champions." The USSF is yet to comment on the legal action. The US finished second to England in the SheBelieves Cup and will be looking to retain the World Cup, which takes place between 7 June and 7 July in France. The Americans are in Group F with Thailand, Chile and Sweden for the first round, and open their campaign against Thailand on 11 June. "The USSF has admitted that it pays its female player employees less than its male player employees and has gone so far as to claim that 'market realities are such that the women do not deserve to be paid equally to the men'," the court papers continued. "The USSF admits to such purposeful gender discrimination even during times when the [women] earned more profit, played more games, won more games, earned more championships, and/or garnered higher television audiences." The US players' union - the United States National Soccer Team Players Association - said it supported the women's team and "the efforts to achieve equal pay". "Specifically, we are committed to the concept of a revenue-sharing model to address the US Soccer Federation's 'market realities' and find a way towards fair compensation," a statement continued. In 2016, Alex Morgan, Lloyd, Rapinoe, Becky Sauerbrunn and Hope Solo filed a wage-discrimination action against the USSF with the Equal Employment Opportunity Commission (EEOC). They said they were being paid less than half of what male USA players receive. The new lawsuit mirrors many of the issues raised by that complaint and the lack of action three years on led the players to seek, and be granted, a right-to-sue letter from the EEOC in February. Their decision to now take their case to federal court means the EEOC complaint is effectively ended.